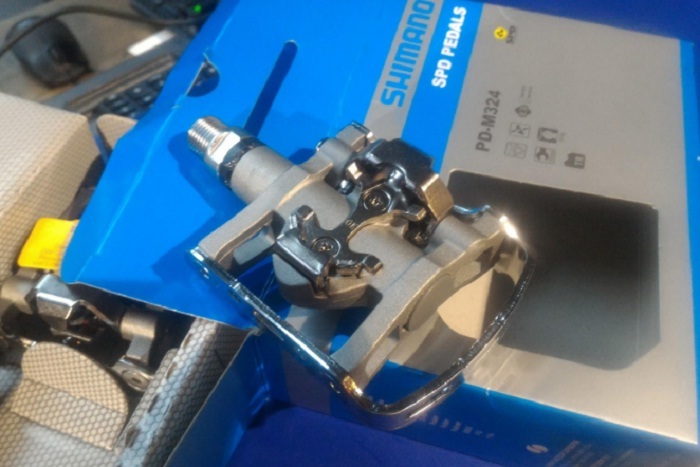 If you’re a keen cyclist, chances are you probably thought about or are already using clip-in SPD (Shimano Pedalling Dynamics) pedals to improve your pedalling efficiency, control, and reduce knee pain. But, what do you do when you want to ride into town to meet friends and don’t want to be walking around in your SPD shoes all day? ‘Platform’ SPD pedals allow you to choose between riding ‘clipped-in’, or simply going cleatless with your regular old tennis shoes. They often feature an SPD mechanism on the one side and a standard metal cage on the other, providing you with the best of both words. Working as a mechanic at a mobile bike shop, I’ve seen my fair share of multi-purpose pedals, mounted on everything from a run-of-the-mill commuter to fully docked, custom-built mountain bikes. 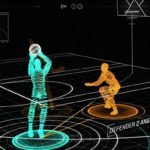 They are a quickly growing category in the world of recreational cycling, and new features and customization options are constantly being introduced. 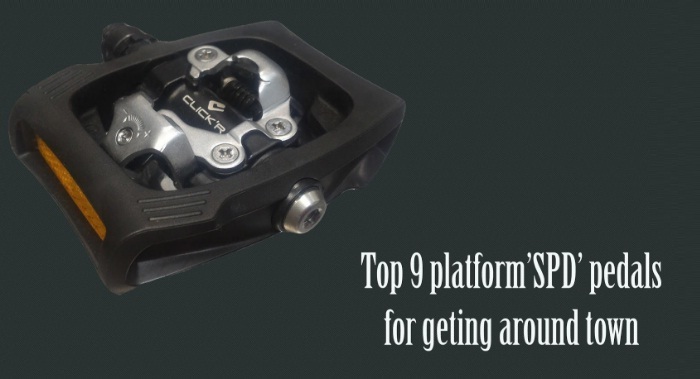 With that in mind, here are the 9 best pedals that you can use with both clip-in and normal shoes (Note: Some of these pedals do ‘clip in’ on both sides, but can be used with regular shoes regardless). The PD-T400 is very much an entry-level pedal, but that’s not to take anything away from its high-performance capabilities. Weighing in at just over 500g per pair, the pedal is undoubtedly of the chunkier variety, which is reflected rather confidently in its overall design. While clearly not the most stylish item on the list, the PD-T400 hardly lacks personality: it’s even reminiscent of the old double-sided mountain bike pedals – if those had been made with built-in side reflectors for the city commute. The PD-T400 is a firm believer in substance over style, which makes it ideal for those new to the world of SPD pedals. If you’re already confident in your clip-in prowess, you’ll want to move onto some of the lower entries on our list – this pedal was made audibly with the beginner in mind. As a result, the featured gripping mechanism is uncommonly light, allowing for a much simpler entry (and release) compared to most of its competition. Although the grip remains indelibly firm on most occasions, even the slightest twist outward should be enough to unlock your shoe. That way, you won’t have to kick and squirm every time there’s an unplanned standstill on your daily commute, which should be reason alone to give PD-T400 a try. Designed primarily for urban cycling, the B’TWIN 500 is as cheap as they come. The dual function pedal dons an all metal construction, outfitted with an aluminum body, steel axle and cartridge bearings. While the clipping itself is typically accompanied by a convincing ‘clunk’, the sturdy steel spring makes it unnecessarily difficult to obtain a firm grip. Still, at only 360g per pair, the B’TWIN remains one of the lighter pedals in its price range, which seasoned cyclists may find reassuring. One of the biggest downsides of the B’TWIN has got to be its distinct lack of ‘float’, i.e. the optional wiggle room for your legs while you’re clipped-in. 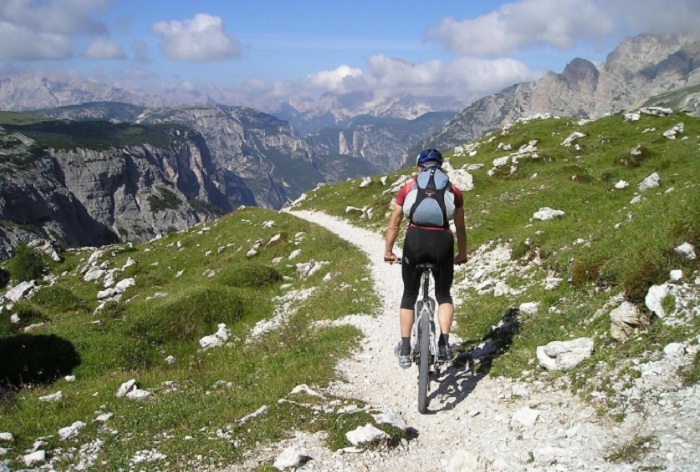 This might not be a deal-breaker for those mainly dabbling in shorter bike rides. A die-hard cycling enthusiast, on the other hand, may find its knees unimpressed with the pedal selection after a few prolonged city commutes. Overall, this is another solid entry-level paddle, although its small platform area and general ‘flightlessness’ puts it below the PD-T400 in many regards. If you’re not looking to spend a penny over $30 for the paddle, however, the B’TWIN is still a strong contender. But, if you’re looking for a bit more float, Shimano’s PD-T420 should do the trick. Aiming to provide you with the best of both worlds, the EX EM15 features a dual-sided design with a standard all-metal cage on one side, and a cleat-binding system on the other. With a promised 6-degree float, the pedal should prove much easier on your knees compared to the likes of B’TWIN, even though it too features a rather bulky aluminum body. But hey, can’t really expect titanium-plated sides for under $45 a pop, right? The EX is compatible with all leading cleat manufacturers, and features a boron spindle as well as pretty smooth sealed bearings. At its core it’s meant to cater to commuter and city-bound cycles though, so if you’re planning on doing a lot of off-road riding, you’ll probably need a better fit. Overall, at 446g per pair, the EX EM15 is a solid, cost-effective solution for those that are looking to seriously transition into the world of clip-in pedals, but don’t wanna say goodbye to their beloved flats just yet. 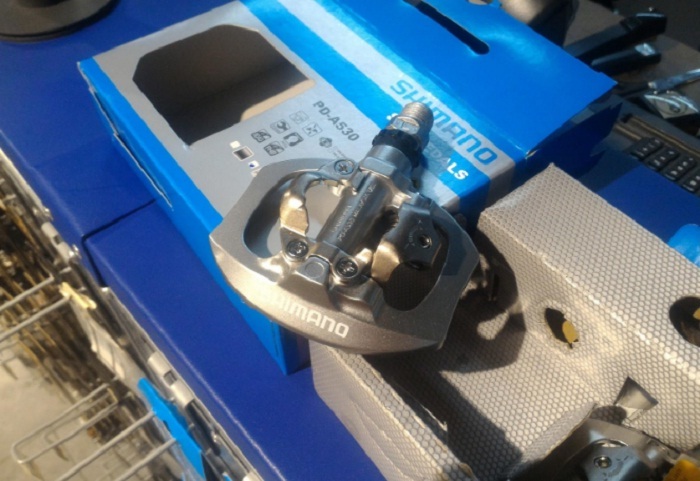 Proving once again that you can’t go wrong with Shimano, the M324 is a reversible SPD pedal with an attitude. Style-wise, the pedal sports a smooth, chromey finish, one you would expect considering its hefty price tag. The M324 features the same SPD mechanism as most other Shimano merch, characterized by multiple tension adjustments options and a substantial float. Its all-metal cage allows for a firm and steady grip, in both wet and dry weather. The ‘flat’ side features a wide, sturdy platform, making the M324 another solid SPD pedal for those that like to alternate flats and cleats. 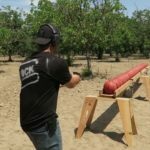 The main question, however, is whether the M324’s dependable performance and an overall solid design justifies its not-insignificant $70 price tag. Although any commuter would be more than happy with the pedal, the fact remains there are more than a few $30 clones out there offering many a same features, at half the price. Still, any $30 pedal is bound to have an undependable shelf life at best, so if you’re looking for a well-constructed, durable SPD reversible, the M324 definitely fits the bill. The MT50 is part of Shimano’s CLICK’R system, designed for those that want all the benefits of an SPD pedal, but find most entry-and-release mechanisms to be too firm and constrictive. 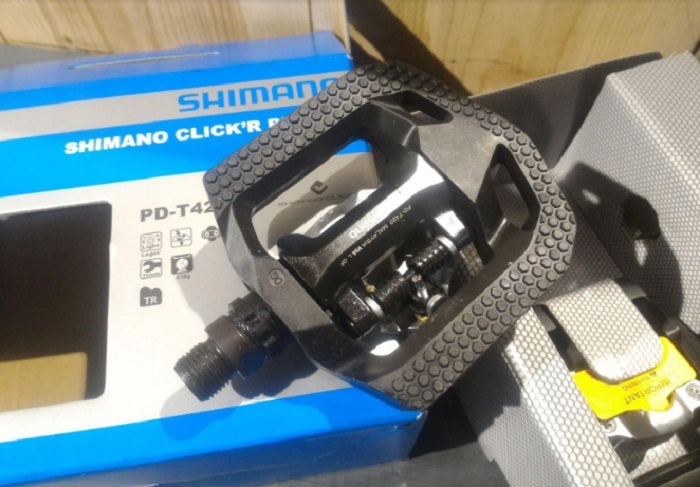 According to Shimano, ClICK’R pedals provide up to 60% lighter (dis)mounts compared to a standard SPD, so it’s no surprise they’ve quickly developed a following in both urban cycling and mountain biking communities, respectively. The MT50 clips on both sides, but you can still use them with your regular shoes. Their primary selling point, however, is the remarkable ease of both entry and release, making them great for everyday commuting and even some off-road action. Keep in mind, however, that the pedal’s ultra-light grip does take some getting used to. If you enjoy the somewhat-restrictive yet reassuring feeling of a regular SPD pedal, you might just find the MT50 a tad too uninhibited for your taste. If you’re a customization junkie, the MT50 makes for an unfettered cycling experience compared to most clip-in options on the market. They are a bit on the heavy side though (498g per pair), and the plastic platform does begin to deteriorate after a while. Overall, however, they provide a pretty good bang for your buck. Clocking out at ~380 grams per pair, the A530 is marketed as an ideal choice for daily commuters and recreational cyclists, and there’s certainly some merit to that claim. The pedal’s SPD mechanism comes with highly-adjustable cleat tension, allowing you to start off with an ultralight grip and turn it up as you become more comfortable. This makes for a great initiatory pedal for all SPD newbies, although it still won’t save you from falling while practicing your dismounts. No pedal will, I’m afraid. The platform on the other hand is ribbed and somewhat concave, designed to make sure you don’t lose the grip regardless of the weather. Unfortunately, more than a few people still found the flat side to be somewhat slippery (especially when wet) – not a negligible issue for a standard ‘commuter’ pedal. Overall, the A530 is a solid, multi-purpose pedal that should last you a good while, thanks to the fully-serviceable cup-and-cone bearings inside. However, if you’re planning on doing most of your cycling in damp and rainy weather, there are probably better options on the list. Although it can certainly be used (and rather effectively for that matter) for your daily commute, where PD-T8000 XT really shines is mounted onto a fit touring or trekking bike. One of the coolest-looking items on the list, the pedal is outfitted with a well-polished, bright alloy body as well as built-in reflectors on each side. It dons a wide, grippy platform on the flat side and an easy-entry SPD system on the other, so you can quickly alternate between clicks and flats based on your cycling preference. Although a solid choice for commuting, the PD-T8000 XT was born for trekking. It’s clear that the PD-T8000 XT treats both clip-in and ‘regular’ cyclists with equal amounts of respect. Unlike most other pedals on here, the platform comes with 8 protruding steel pins, meant to ensure a good grip regardless of the weather. As for the cleat enthusiasts, the clipless side comes with an adjustable entry/release tension and an angular float of about 3 degrees, give or take. At 392g per pair they’re certainly not featherweights, but can hardly be described as chunky either. Slick, stylish and versatile, the Double Shot should be a treat for any longtime Crank Brother cleat user. The hybrid pedal does clip only on one side though, so even if you’re not a huge fan of CB’s custom cleats, there’s still a lot to like about the end product. The chic design can be found in black, orange, green and blue, and the pedal’s double-seal system as well as quality bearings vouch for its longevity. On the flat side, the platform comes laden with molded pins and horizontal ribs, while the diamond plates provide traction. The Double Shot touts superior mud-shredding potential, so don’t be afraid to mount these bad boys on a touring or mountain bike. As far as riding clipless, the pedal is designed for Crank Brother’s custom cleats, so if you don’t own a pair or plan on mostly riding flat, you’ll be missing out on a big part of what makes these pedals special. At 395g per pair and a retail price of about $100, the Double Shot is neither the lightest nor the cheapest pedal out there, but it still serves a particular (and fairly vocal) niche of recreational cyclists – and it does so pretty well. The X2 was designed with help from two-time World Cup champion Aaron Gwin, so you know it means business. 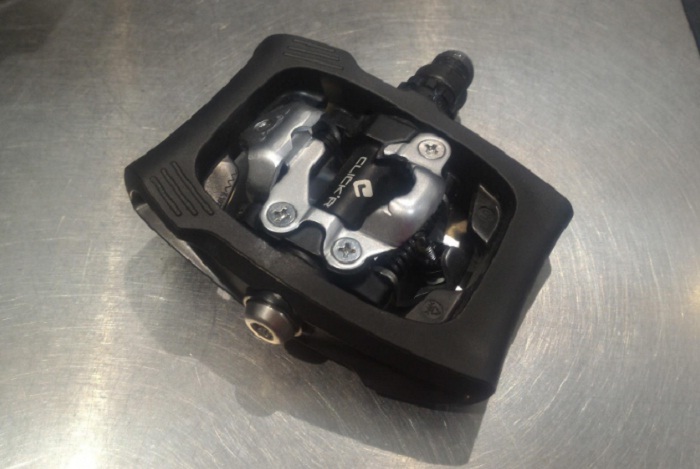 It’s marketed as a direct competitor to 2 of the most popular downhill clipless pedals at the moment – Crank Brothers Mallet DH and Shimano’s DX. All three feature a unique clip-in system and a massive platform area, but as a relative newcomer to a rather unwelcoming party, the X2 manages to hold its own pretty admirably. It helps if you’re endorsed by cycling royalty. The clip-in mechanism is a hybrid between CB and Shimano, and is almost reminiscent of mounting a ski boot – you need to slide the tip in first and then press it down, and there’s a rather audible ‘click’ informing you that you’re in. 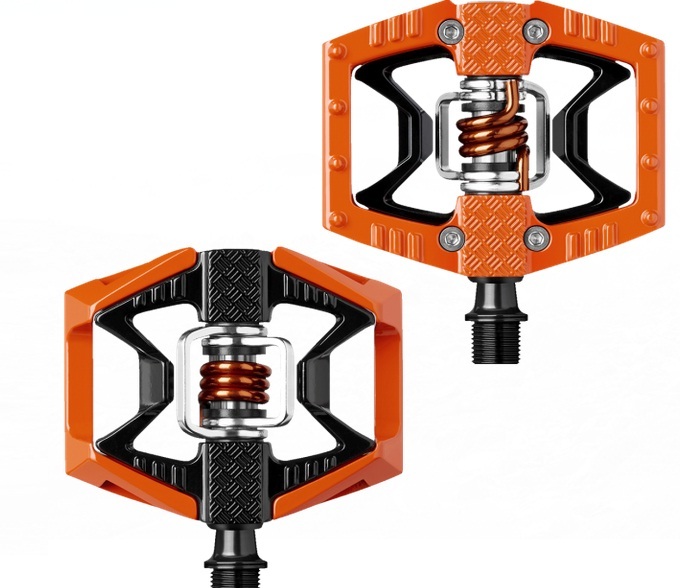 The pedal features an adjustable spring tension and has a 13-degree release angle, as well as about 4 degrees of float. Overall, the X2 is a solid alternative to two brands currently dominating the downhill clipless market. Still, the heavy steel cleat and an unnecessarily complex clipping mechanism do leave much to be desired. In the end, it’s worth pointing out that double-feature pedals can be both a curse and a blessing for someone just now making the transition. 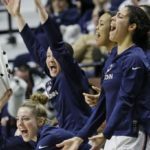 On the one hand, they obviously provide a highly-customizable experience, allowing you to easily switch between cleats and flats throughout the ride, depending on your route, unplanned detours or even just personal preference. It should be noted, however, that too many options isn’t always a good thing – especially if you’re often forced to make split-second decisions (as cyclists certainly are). The time you spend choosing the ideal pedal side is always going to be the time you’re not fully minding the trail. So although tempting, constantly alternating between flats and cleats is best left to the veteran cyclist, at least until you get a solid grip on all the mechanisms and forces involved. With that in mind – stay safe, and happy cycling! 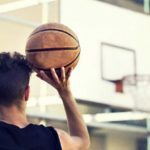 www.sportinggoodsinfo.com is an independent resource and buying guide of the best sports equipment and recreational accessories for the sportsman and sports lovers who want to know what to get now. When our honorable readers intend to buy our independently chosen recreational stuffs, we earn affiliate commission that support our effort. 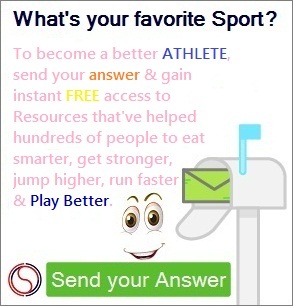 www.sportinggoodsinfo.com is a participant in the Amazon Services LLC Associates Program, an affiliate advertising program designed to provide a means for sites to earn advertising fees by advertising and linking to Amazon.com and Amazon, the Amazon logo, AmazonSupply, and the AmazonSupply logo are trademarks of Amazon.com, Inc. or its affiliates.